Thread: ProviderModule infected with Russian Bitcoin miner malware. Again. Yeah PM has not been loading for a few days. Right now it loads (Which is how I'm posting This), hopefully it's solved soon. 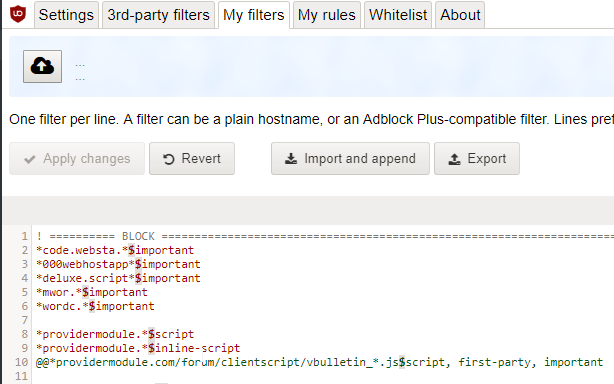 These uBlock filters will keep the malicious scripts from even reaching your machine by preventing the load of the first-party PM scripts that inject the rogue scripts into the page on load. .../forum/clientscript/yui/connection/connection-min.js in particular is the script injecting the "mwor" and "wordc" scripts on the forum. So blocking that alone was enough to kill the rogue scripts before they even exist. But better to bloack everything with extreme prejudice and only allow what's absolutely necessary.